In 2003 a boy not quite four years old, Colton Burpo, had to undergo emergency surgery for a ruptured appendix. While near death on the operating table, he visited heaven and over several months told his story to his parents Todd and Sonja Burpo. Although Todd is a part-time pastor, he is initially amused and skeptical that his son “met Jesus.” At first he asked Colton if he is telling the truth. However, some of his statements have a powerful ring of truth. Todd is stunned, because there is no way Colton could have known those details. “You had a baby die in your tummy didn’t you? A little girl came up to me when I was in heaven” who said she was his sister. He described her as a dark-haired girl who resembled his other sister, Cassie. While Sonja had suffered a miscarriage years before, neither his mother nor father had ever told Colton about it. “There’s just no way he could have known,” Todd asserts. Then he talked about meeting Jesus who had “markers” on his hands and feet. His parents were puzzled. “Markers?” Then the 4-year-old described his bloody wounds on Jesus’ palms that he had never seen before in pictures of Jesus. Todd wrote a book about his son’s experience, “Heaven Is For Real,” that has been a runaway best seller. Thomas Nelson, the book’s publisher, said it had broken company sales records. An initial print run was 40,000 copies, but it has gone back to press 22 times with more than 1.5 million copies in print. It is No. 1 on the New York Times best seller list for paperback nonfiction. 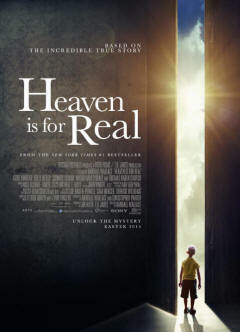 My wife and I saw “Heaven Is For Real” and recommend it as the perfect film for a family to watch together. As pastor of Crossroads Wesleyan Church in Imperial, a farming town in southwest Nebraska, Todd was unsure of what he should tell his congregation about Colton’s visit to heaven. Oddly, Todd seems almost tongue-tied in telling Colton’s story to his congregation. He was apparently too embarrassed to tell them about how Colton saw him yelling at God, but that detail is what made him believe Colton really did have a supernatural experience. However, his halting performance prompts some church elders to consider firing him. Todd already works as a garage door repairman to make ends meet. And Sonja leads the church’s music department. Colton is portrayed very winsomely and credibly by Connor Corum, a blond charmer. Over a period of months, he reveals more and more details of his visit to heaven. He tells Todd about meeting his grandfather, who Todd loved. Among others who Colton met in heaven is Samson of the Old Testament and John the Baptist. The film is not saccharine, however. It portrays Todd as angry at God over his son’s near fatal illness. Doubt is revealed as part of faith. However, heaven and Jesus are real.